Tier II city. 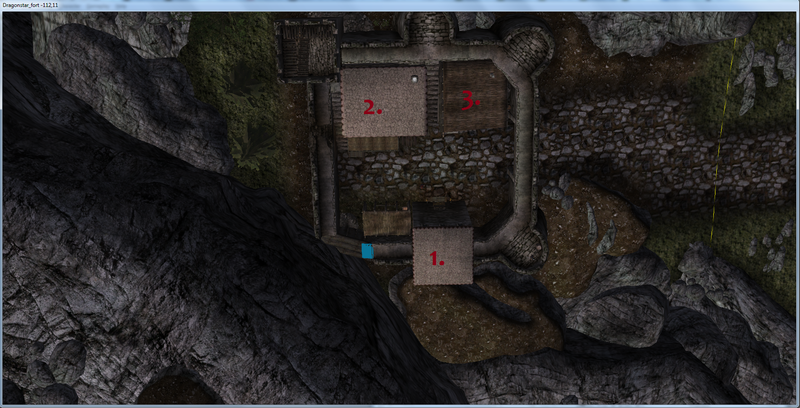 ~15 interiors on each side of the wall + farmhouses. Claiming this for now. Markarth on hold. 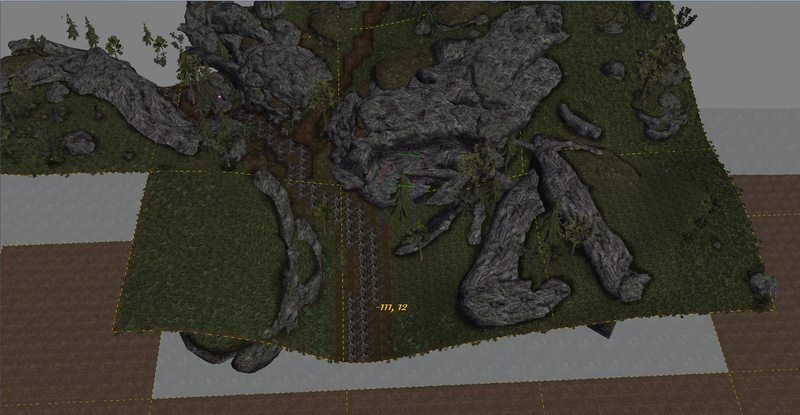 WIP map inspired by Yeti's concept map. Some areas are still very undeveloped. It still seems a bit too spaced out at the moment, but I like it, overall. 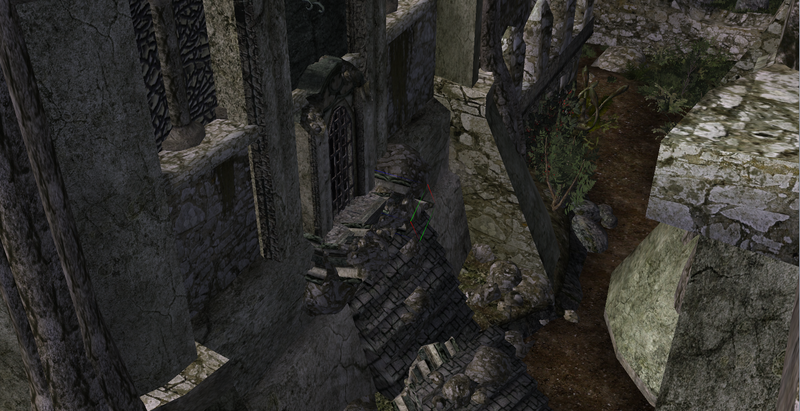 Maybe remove the pasted redguard quarter and add the houses to either halves of the town to have a bit more of a cramped town feeling and more hiding-places? If possible, Dragonstar should generally have an uncomfortable atmosphere. Maybe add a few more small houses (destroyed and undestroyed), if needed. But other than that I like the layout and the amount of bigger houses seems about alright. 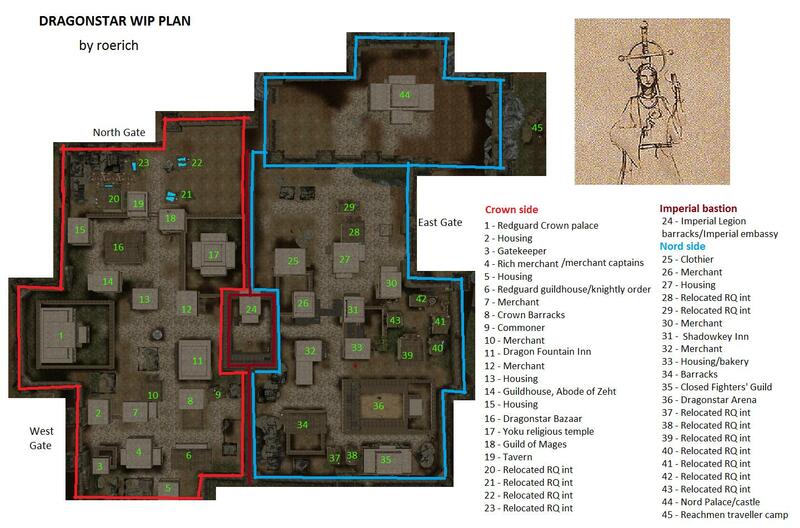 We should probably keep our reach redguard towns squared, while trying to do more organic layouts in other town settings. I'm making it a bit more cramped as we speak, like a more compact and urban Karthwasten, only smaller. Thanks for the input, I will try to work my best. 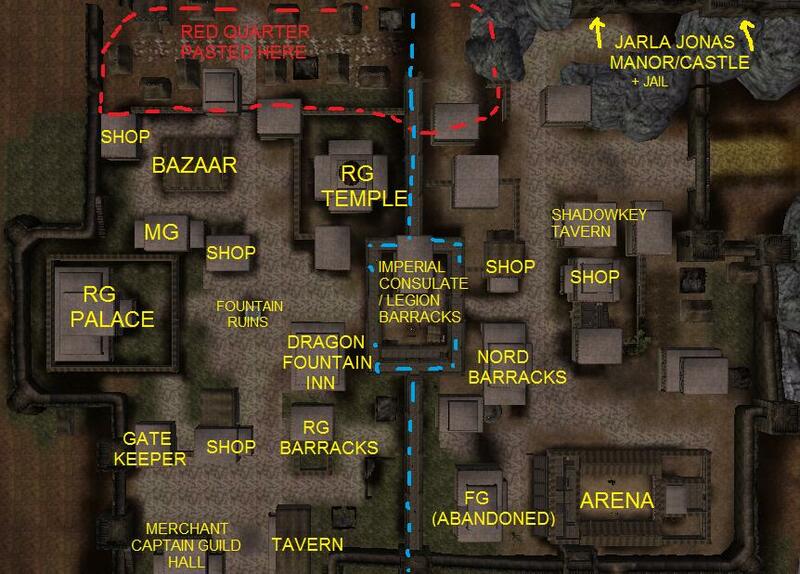 Agreed about square towns for Redguards. It's the best way to use the set, and it's consistent with Karthwasten. It also works to show some cultural differences between the wild Nords and the more cosmopolitan Crowns of Hammerfell, even if a minor one. Cosmopolitan is probably one of the last words I'd use to describe the Crowns - they're devoted to conservative Yokudan traditions and greatly dislike foreigners - but I agree the square urban layout fits their architecture. I wouldn't mind seeing some use of elevation here though - perhaps in the area that Jarla Jona's headquarters occupies. So far though, I'm loving what I see here, roerich. You've got the size and arrangement down just right. I do agree with Worsas on interspersing the smaller houses among the larger ones. You're right, I should have put 'city-dwellers'. I'm already adding some elevation right now, all over the city. And thanks, I'll try to make the smaller houses look good, though they'll mainly be put in back-alleys and such. I'm sorry for different perspectives. Cells' edges are left intact. 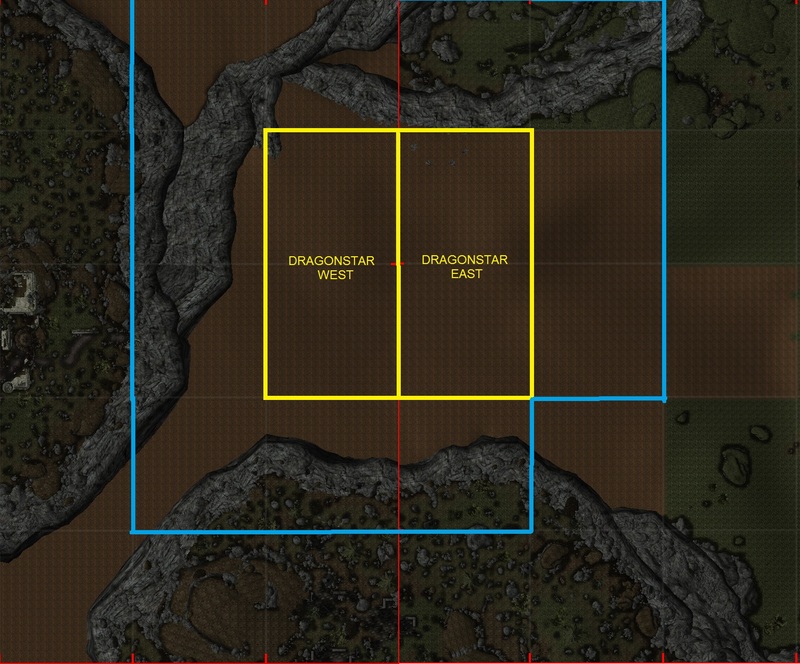 Would that design even tile with your concept for Dragonstar? First and foremost, would the roads meet each other if led that way? Sure, go ahead. 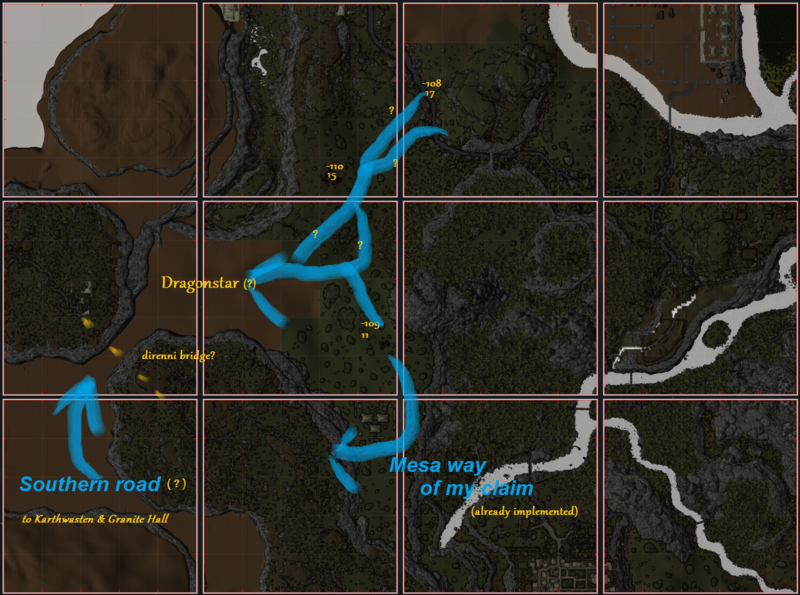 I think it will line up fine, my road is in the north/middle part of the canyon, but it can be altered. Claim passed on to berry. Very excited to see you take this one! I have tried to follow our concepts, but it's a WIP mess right now. Some parts are nearly finished, except that it needs adjustment to landscape. 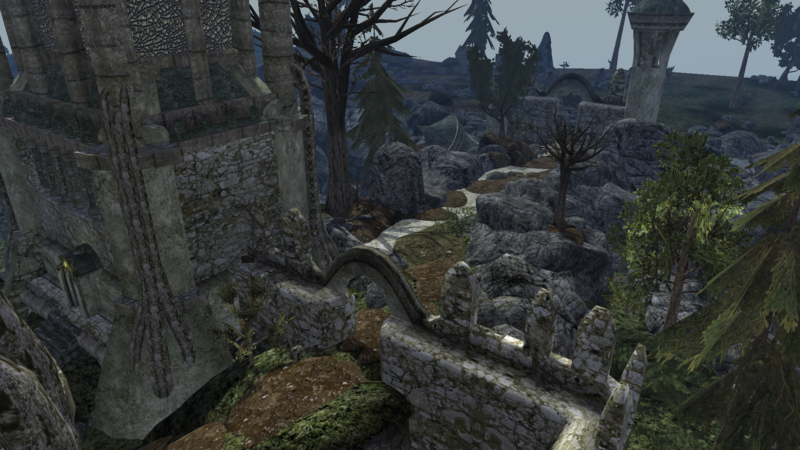 The landscape part is almost unworked on, except for broad concepts of height and cliffs. Town layout is complete, as well as the wall dividing the city into two (fits the cell border so dialogue should be easy). Here's my plan for the interiors to help you develop the area around them. I have uploaded the most recent file. My first update. Foremostly I worked on the city walls, cliffs around the city and the height differences in the city itself, and this issues are dealt with now, mostly. 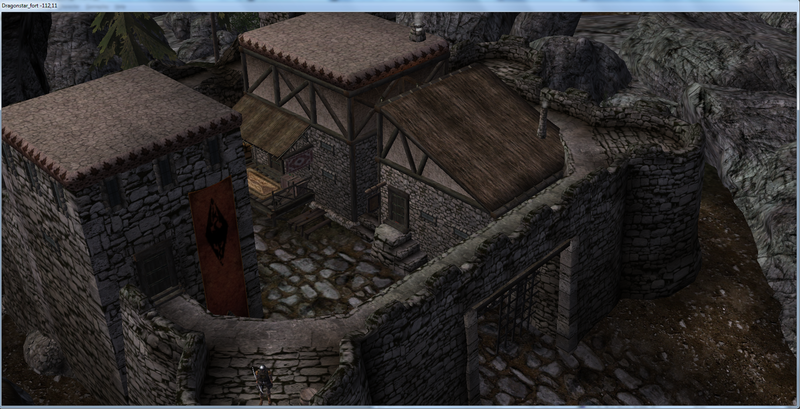 Some areas, like the bazaar, fighters' guild/arena surrounding or the "plaza" in Dragonstar East received some detailing as well. 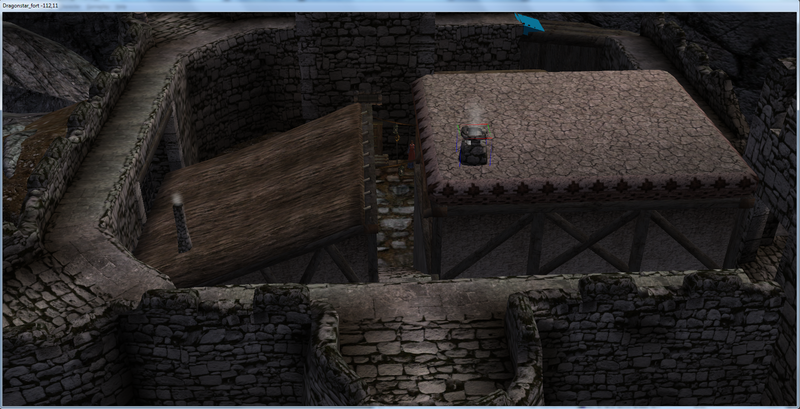 Included (mostly finished) cells from my Druadach claims and some generic/Shadowkey NPCs too. I have some concepts or just general thoughts for this city and it's citizens that I'll try to put into words in some days, I'm being feverish recently. edit: I realised I never said how cool this city is, roerich. The dividing wall and the arena especially are masterpieces. Make sure not to become too ill. I'm sure nobody around here would want to lose you to an influenza or something worse. Take your break whenever needed. Also, great work on the cliffs. I like this much more since the city has been properly embedded in the surrounding landscape. I'm absolutely loving this! Just keep doing what you're doing, I like everything so far. The bazaar in particular is my favourite place, looks really busy. I also like how you fixed the wall, especially around Jarla's castle. The road leading up there looks really perfect in its placement to the walls and its elevation. 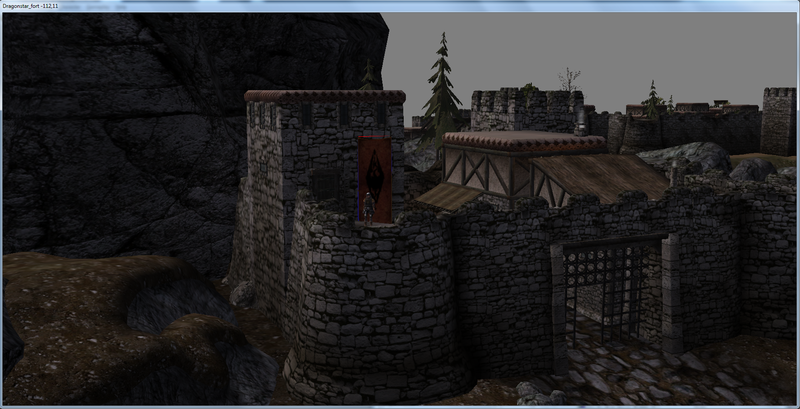 It's all coming together now with the mesas and Dragonstar in between. This layout looks very interesting! Excellent work everyone! Yeah, it's pretty exciting how many finished cells we will have soon. And thanks for feedback everyone, I want to get some more work done on it and my wilderness claim, now that I feel somewhat better. I was wondering if we could get some exotic goods to be found on the bazaar solely, from PC data, perhaps? PC's hanging clothes could serve the Redguard half well too. I would like to create really unique atmosphere here, given it's the only so Western city the players will get to see for years, at least untill Sutch is done (if I recall PC's lore correctly). Another thing is, do we want some kind of land connection joining this area with western canyon or the mesas around? 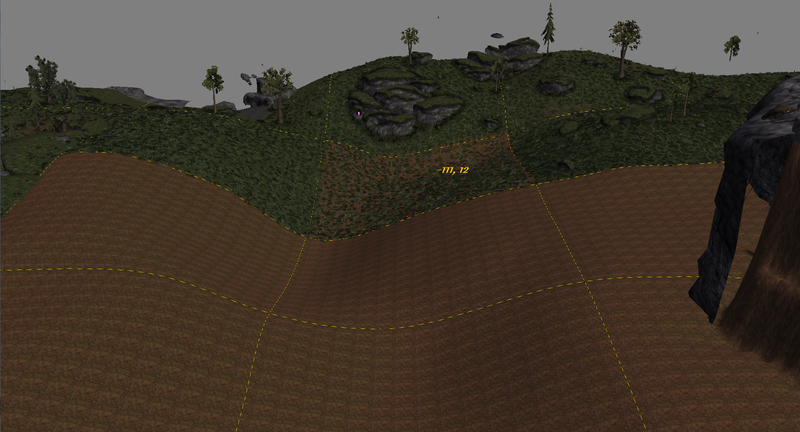 We should rather get this settled before we have surrounding landscape finished, this time. Personally I wouldn't bother with any major road down the canyon - it has that great, isolated and run-down look - and Haimtir's mesa already has a road connection not that far from here, but we really should think for something for Scamp's mesa #2. I still think a Direnni bridge might be a solution here. I've been meaning to reply to your model requests here, but I forgot about it. I would rather not use hanging clothes in Skyrim at all, apart from the fact that I disagree about additions that are only used in a single context. Using the same exotic assets seen in Karthwasten should be completely sufficient. We've got redguard lamps, hookah, flat bread and possibly other stuff that won't have use in any of the Nord towns. The only other redguard stuff I would still add at this point is some redguard clothing. That's fair. You're right, these assets should suffice. Plus I forgot how we are already having an unique fountain here, any more meshes would be an overkill. worsas wrote: flat bread and possibly other stuff that won't have use in any of the Nord towns. Just wanted to chime in and say that the flatbread was intended as a simple bread baked by (farmer and rural) Nords and Reachmen, not a Redguard import. To be used along with the Colovian loaf of course, and the vanilla bread. And now to your Direnni bridge question: I think that it would actually make very much sense, if you consider the two Direnni ruins that would be connected via this bridge. It would, but I personally think it would disturb the mesa scenery and vista too much. I don't think we should have bridges between mesas, at least not the larger ones. Hmmm. fair enough. I was having slight concerns in that direction aswell. The lanscape shouldn't end up too filled with structures in the end. The Direnni Ruins are already a very prevalent sight, after all. But look yourself, I'd say. Im with roerich on the direnni bridge matter. I think such a bridge would allow for more interchanging player movement between mesas and easier access and even more exploration if there were more ways to access these mesas. Especially the second mesa would probably remain unnoticed by many players if it were not for a bridge coming from the other end. I do think it would look fantastic, too. How about a rope bridge going into the cliffsides? Both sides with short cave systems connecting to the surface of the mesa. Perhaps even to the ground as well, on one side. Edit: The Direnni bridge. Besides the mesh itself not being usable for this location due to the central pylon, I think it makes the mesas appear smaller than they are and should appear. That wins the discussion imho, Roerich. I'm all for the Direnni bridge ruins on both sides, but I'm not sure I like this rope bridge thing. Thinking about how Morrowind plays when you're actually running around an open area in-game... I doubt many people would find these caves. 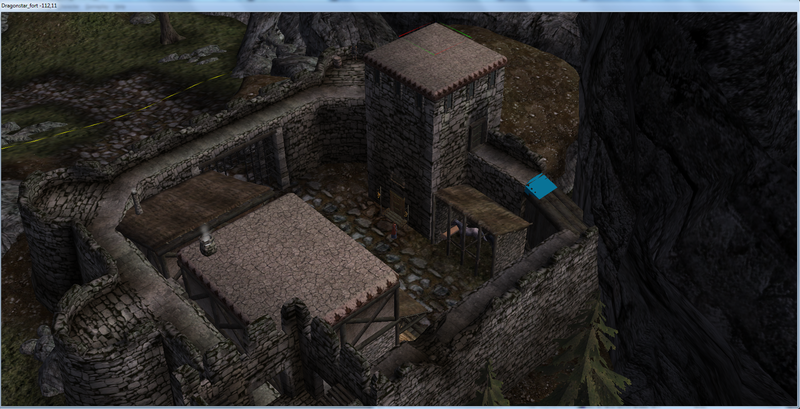 I see there's no way we can place an actual Direnni bridge here, but that rope bridge looks rather meh. In that case, I think we may have to be good to go with the bridge ruins only. I was thinking the caves would be connected to the road, so a player following the road would find them easily. Perhaps put some sign of human activity, lanterns and wares, outside the caves, showing that they are used for transport. But I see your point. Ruined bridge could be an idea. Perhaps we could make a ruined bridge with part of the bridge being a rope bridge built there later, making it usable again. 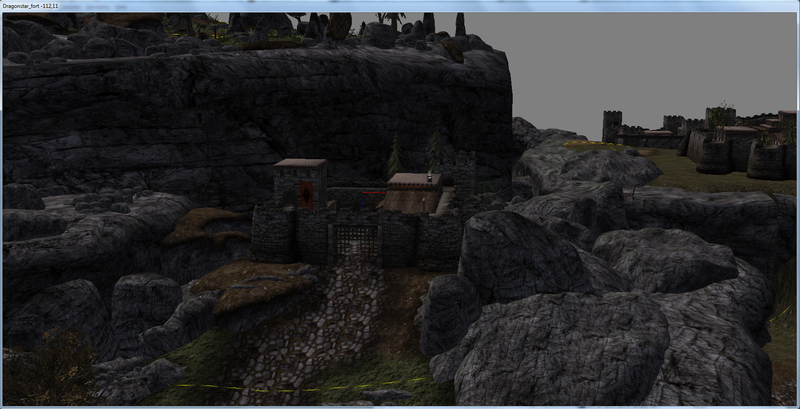 That could look good, I tried my hands on it in some of the earliest Markarth work. I do think we should remember (or at least that's my impression) that the Direnni didn't have a sprawling civilization here, with road networks and cities. More like a series of strategically placed fortresses in wild and rural region populated mainly by native primitive tribesmen. Their heartlands were far more to the west, the Western Reach and even more so our side of the Reach was their ultimate frontier zone. It does make sense for the two fortresses here to have been connected, though. A castellum. There would be a small imperial shrine on the ground floor (perhaps run by Seraphidis, an exiled priest from Dragonstar?) and commander's suite on higher levels. Barracks, with a canteen and a day-room on the ground level and a bedroom upstairs. A smithy/armory, containing a forge, small warehouse and quartermaster's bedroom in the attic. I'll probably replace a stable with a training ground of some kind. Horses wouldn't be very handy for military goals in such highland area. What do you guys think about it? I was afraid this castellum mash-up would turn up wrong, but thanks to these new textures it looks rather neat I think. Indeed. Probably the best piece of makeshifting I have seen in a long time. I was unsure about this nearby imperial fortress for a while, but I think it works greatly now. It looks really nice, great work!